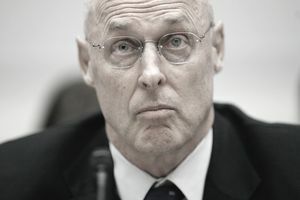 Henry Merritt "Hank" Paulson, Jr. was U.S. Treasury Secretary from July 10, 2006, to January 20, 2009. His response to the 2008 financial crisis prevented a global depression. Paulson's background, direct personal style, and opinions regarding the economy propelled the U.S. Department of the Treasury into a pivotal role during his tenure. The U.S. Treasury's $11 billion budget makes it one of the largest. It controls another $358 billion in tax credits and debt financing, including Treasury bonds. It manages the Internal Revenue Service, the U.S. Mint, and the Bureau of the Public Debt. President George W. Bush hired Paulson for his strong connections to Wall Street and China. Paulson had been the Chairman and CEO of Goldman Sachs since 1998. During that tenure, he made over 70 business-related trips to China. He was a strong advocate of corporate accountability and disciplined spending. For those reasons, he became the point man for efforts to both reduce the budget deficit and increase U.S. economic competitiveness. Cut the budget deficit in half by 2009. Address the long-term unfunded obligations of Social Security and Medicare. Reduce regulation on foreign capital investment. Bush also hired Paulson to work with China to raise the value of its currency. At the same time, he wanted China to open its financial markets to U.S. investors. Paulson immediately launched the U.S.- China Strategic Economic Dialogue, in which high-ranking U.S. and Chinese officials agreed to meet twice a year to further economic cooperation between the two. As a result, China began to open its financial and services sectors to U.S. investors, lower its subsidies to its exporters, and allow its currency to rise. The Dialogue was continued by during the Obama administration by Paulson's successor Tim Geithner. The 2008 financial crisis diverted Paulson's attention back to the United States. In February, he helped launch the Bush Economic Stimulus Plan. The Treasury Department sent $98 billion in tax rebate checks to spur spending and growth. On July 23, he pushed the conservatorship of Fannie Mae, Freddie Mac, and the Federal Home Loan Banks. The two agencies held or guaranteed more than half of the $12 trillion of the nation's mortgages. Wall Street's fears that these loans would default caused Fannie's and Freddie's shares to tumble. This made it more difficult for private companies to raise capital themselves. Paulson reassured talk show listeners that the banking system was solid, even though other banks might fail like IndyMac. Later that week, Congress the Treasury Department authority to guarantee as much as $25 billion in loans held by Fannie Mae and Freddie Mac. It also allowed $300 billion in FHA loan guarantees, $15 billion in housing tax breaks, and $3.9 billion in housing grants. On September 15, Paulson announced that there was no deal to save beleaguered Lehman Brothers investment bank. Paulson had held a weekend negotiation with potential buyers Barclay’s and Bank of America. But he refused to guarantee Lehman's $60 billion in uncertain mortgage assets. On September 17, investors fled money market mutual funds. The Reserve Primary Fund broke the buck and caused a money market run. Investors were concerned about spreading losses from Lehman’s bankruptcy, As a result, businesses couldn't get money to fund their day-to-day operations. If it had lasted another few weeks, shippers wouldn’t have had the cash to deliver food to grocery stores. Money market accounts had been considered one of the safest investments. On September 21, 2008, Paulson and Federal Reserve Chair Ben Bernanke went to Congress. They requested approval of a $700 billion bank bailout to buy up mortgage-backed securities that were in danger of defaulting. By doing so, Paulson wanted to take these debts off the books of the banks, hedge funds, and pension funds that held them. But Congress didn't want to reward bad banking decisions. The House of Representatives voted against it on September 29, 2008. The Dow fell 770 points and global markets plummeted. To stem the panic, the U.S. Treasury Department agreed to insure money market funds for a year. The SEC banned short-selling financial stocks until October 2 to reduce volatility in the stock market. On October 3, 2008, Congress approved a similar bill. President Bush signed the Emergency Economic Stabilization Act of 2008 into law within hours. The U.S. government promised to support the banks who bought bad mortgages. Without the bill, banks were afraid to lend to each other. Financial firms were unable to sell their debt. Without the ability to raise capital, these firms were in danger of going bankrupt. That's what happened to Lehman Brothers. It would have happened to AIG and Bear Stearns without federal intervention. Paulson got his B.A. from Dartmouth in 1968. He was a member of Phi Beta Kappa, and an All-Ivy, All-East football player. He received an MBA from Harvard Business School in 1970. Paulson was a Staff Assistant to the Assistant Secretary of Defense from 1970 to 1972. He became Staff Assistant to President Nixon from 1972 to 1973. He joined Goldman Sachs in 1974. Paulson wrote about the 2008 financial crisis in "On the Brink." In 2015, he wrote "Dealing with China."